These sliders have been designed to offer unsurpassed protection to your swingarm, calipers and rotors in the unfortunate event of a lowside or tip over. 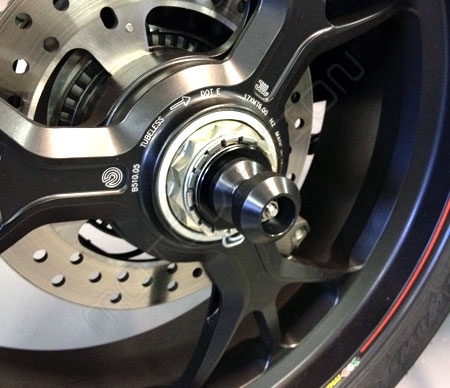 Riders around the world have tested our products on the street and track with outstanding results. Match up the puck spacers to the appropriate side of the axle opening, based on axle opening size. Install one of the slider pucks using the appropriate spacer onto the axle slider rod. No need to tighten the axle rod bolt fully yet, as you will tighten this up further when completing the installation. Blue Loctite is highly recommended. Insert the rod with the slider puck and spacer attached into the axle opening. Make sure the slider puck spacer fits snugly into the axle. If it does not fit snugly, you may be inserting the rod into the wrong axle side. 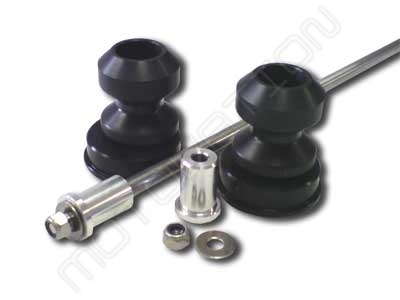 Spool style rear axle sliders have machined spacers to fit properly inside the axle openings. Install the second slider puck and spacer on the opposite side and tighten the bolts in unison until the slider pucks are snug and will not easily rotate. DO NOT OVER TIGHTEN.